It was a personal crusade to overcome the setbacks and adversity in his early life and help others do the same. These efforts provide a valuable lesson for all of us to overcome and triumph in the face of all difficulties. Professor Wiriya or Acharn Wiriya as he is popularly known, is a lecturer in the Law Faculty of Thammasat University. He attended St Gabriel’s School and later Assumption School, Bangrak and completed school in 1972. 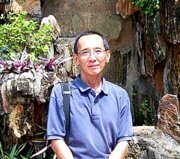 He studied Law in Thammasat University and graduated with a Law degree in 1976 when he became lecturer in the Law Faculty of Thammasat. Later in 1993, he got his Masters in Law (Taxation) from Harvard University, USA. Acharn Wiriya’s academic achievements are all the more impressive because he is blind. 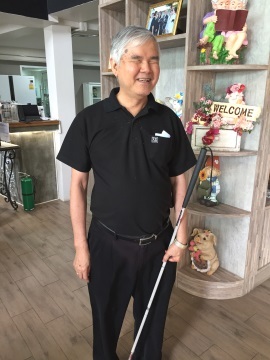 He has been blind since the age of 15 owing to an unfortunate accident. This tragedy plunged his world into darkness and shattered his dreams of becoming a doctor. The only road open to him then was to attend the School for the Blind to learn Braille. It was here that he met two women who would have a profound influence on the rest of his life. The two women were Sister Rose Mour, the Irish Mother Superior of the School for the Blind in Bangkok and Miss Genevieve Caufield, a blind American teacher in the school. At this school, Acharn Wiriya learnt the Braille alphabet in English and Thai, the Braille typewriter and the normal typewriter. More importantly, these two women revived his hopes and filled him with a resolve to succeed. They impressed upon him the importance of preparing himself to empower the disabled like himself, to equip them with the knowledge and skills to contribute confidently and productively to society. Acharn Wirya went on to complete his secondary and tertiary education. This traumatic experience in his early life instilled in him the will to succeed and inspired this book written in the late 1990's. The title of the book translates to "Fight on in Life – create opportunity in adversity". 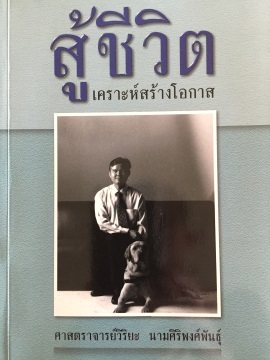 With the sales proceeds of this book and the help of like-minded supporters, he established the Universal Foundation for Persons with Disabilities on 2 February 1999. The foundation is co-located in the building that was his home. To instill a positive attitude in society towards the disabled; that the disabled are not liabilities, they have the potential given the right development to contribute to society. To protect, develop, rehabilitate and support the disabled to have the same human rights as normal people. To canvass the public and private sectors via the mass media to provide a better quality of life for the disabled. To train the disabled to have the self-confidence and public-spiritedness to help others like themselves. To get there, please see the map to the Universal Foundation for Persons with Disabilities. Yimsoo is a word we will frequently see when we visit the foundation. The name is a combination of two Thai words; yim – smile and soo – to fight on, struggle, withstand, overcome. 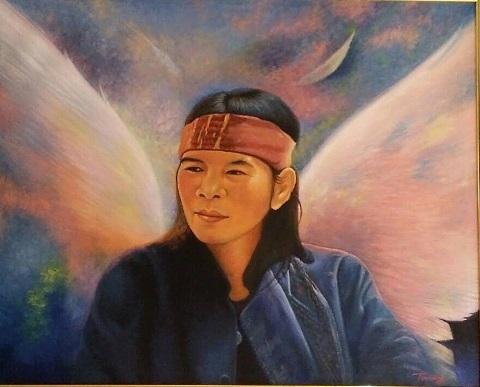 This name, Yimsoo reflects the philosophy of Acharn Wiriya and the foundation he founded; to smile in the face of adversity, to fight on and overcome all odds. We had the opportunity of meeting Acharn Wiriya during our visit who asked one of the volunteers to take us on a tour of the facilities of the foundation. 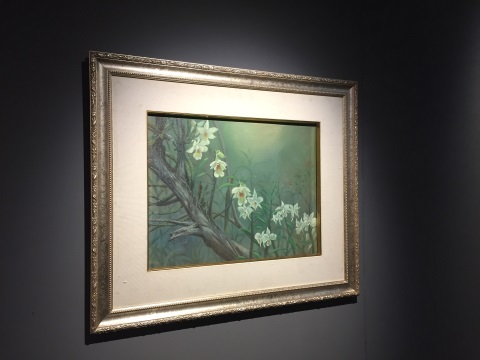 Puk Luk was not only thoroughly familiar with the facilities but she was even able to tell us the inspiration behind some of the paintings in the gallery. The first stop in our visit to the foundation was the training centre for autistic children. We viewed some of the facilities available for training these children. As our visit was during a weekend, there were no classes so we were not able to see some of the students in their training. There is an audio library upstairs with a row of sound proof rooms equipped with desk top computers. 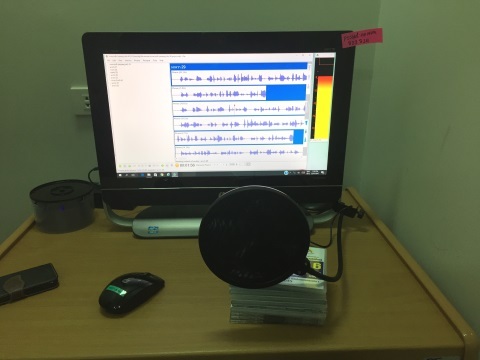 Volunteers read books aloud which are recorded and saved into an open source (free) program called Obi*. A visually impaired person can sit in this room and listen to these recordings just as we would read a book. *Obi was developed by the Daisy Consortium, an international organization dedicated to creating audio libraries world-wide. Art is one avenue for the disabled to express themselves and from the exhibits displayed below, they have done so superbly. 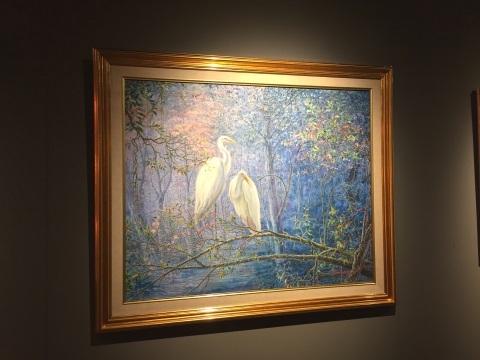 The art gallery was the highlight of our visit. 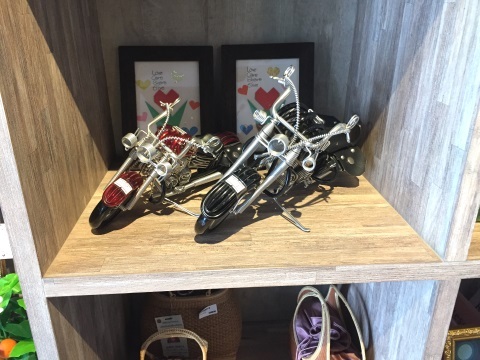 This art museum displays oil paintings, water colours, sculptures, pottery and various forms of artwork and handicraft by the disabled. 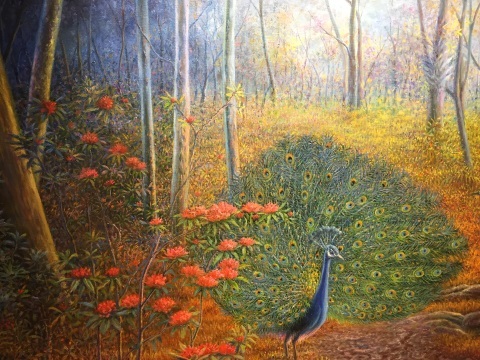 Most of the artwork are oil paintings by various disabled artists. 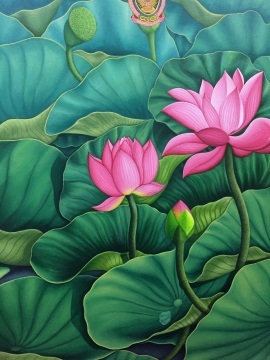 There is a gallery dedicated to the paintings of one artist, Thanong Kotchompoo. 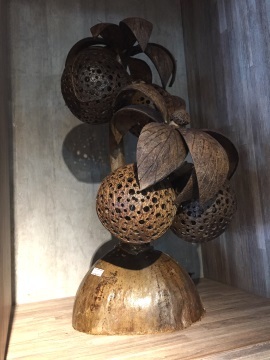 Here’s a sample of his works. Thanong 54, a native of Nong Khai, is paralysed from the neck down. At 13, he had a muscular disease that paralysed both his legs by the age of 18. When he reached 25 he lost the use of his hands as well. He paints holding the brush in his mouth! 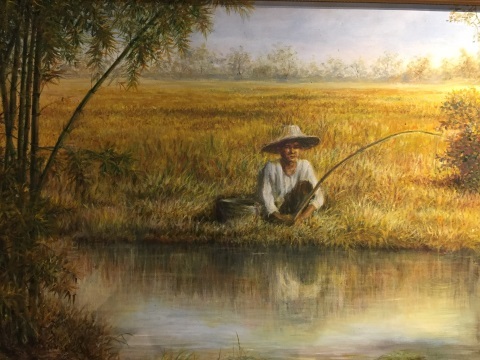 Thanong’s paintings of rural Thailand reflect the beauty of the countryside and also evoke a sense of isolation and loneliness. 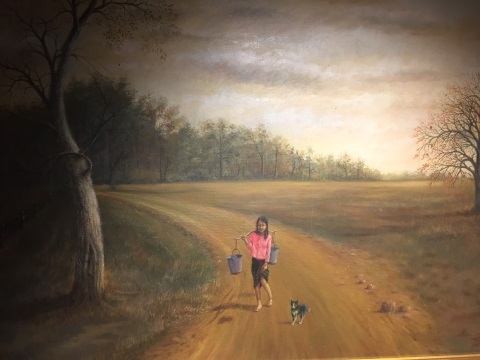 I found this particular painting rather sad; it shows a young girl carrying two buckets of water along a lonely country road accompanied only by a dog. 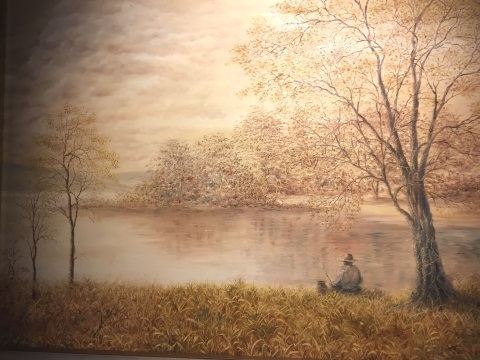 Thanong painted this scene of his sister. There are more paintings in another part of the building. 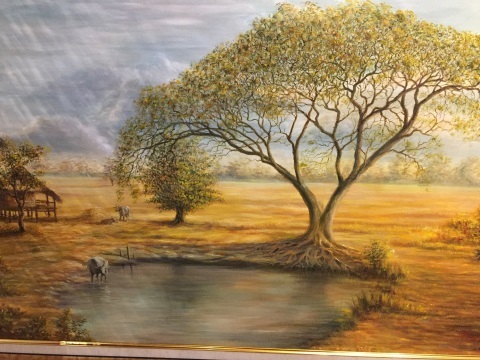 This set is by Lornson Lokum, an artist who has no arms, he paints with his feet. 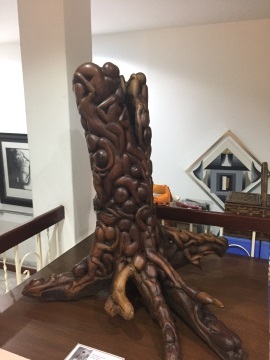 The wooden sculpture "Step On" is by Id Srisamai, who is paralysed in the right arm and without her right leg. 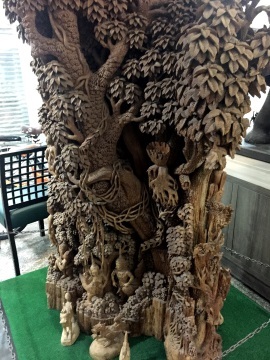 Here is another piece of elaborate sculpture, carved from a solid tree trunk by Pisadan Duang-in who has impaired hearing. 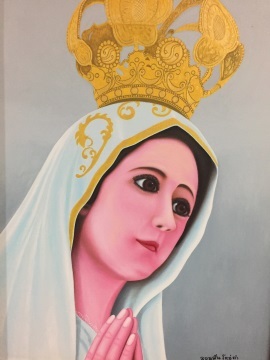 What divine light could have inspired these artists to express such glorious beauty in spite of their physical limitations? Communications between people who cannot hear or speak with those who can is one of the biggest problems faced by the disabled. Thai Telecommunications Relay Service (TTRS) is a project jointly initiated by the Universal Foundation for Persons with Disabilities and the National Broadcasting Telecommunications Commission (NBTC). Avaya, a technology company specializing in communications solutions, developed the product. The system is based on an intermediate or relay centre that translates sign language to voice and vice versa between the two parties. The TTRS kiosk is about the height of a vending machine but slightly narrower. It has a video screen for those who are 1.5 m (almost 5 feet) in height or above. For children or those below 1.5 m, a smaller screen is available lower down. *I was under the misimpression that sign language is universal; it isn’t. There are different systems for different languages. The user inserts the identity card in the slot and a staff member from the relay centre will appear on the screen to communicate with the user. 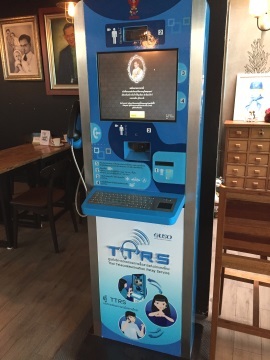 The TTRS can be used when the disabled and normal persons are in one others’ company or used by the disabled to contact a normal person through any phone. Here are two short videos to illustrate the use of the TTRS. These two videos are in Thai and only one of them has English sub-titles. But don’t worry, the meaning will become abundantly clear to the viewer as the story unfolds. That’s the beauty of these productions by the Thai media companies; they cut right across language barriers. 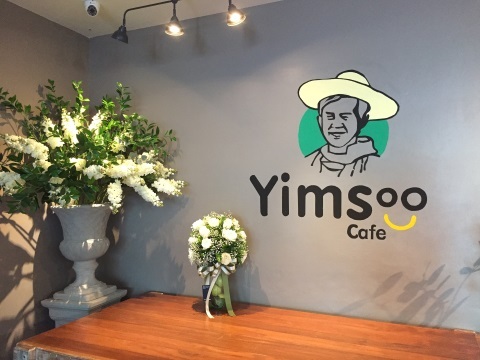 Established in December 2016, the Yimsoo Café is the latest addition to the foundation. It provides employment opportunities to the disabled. 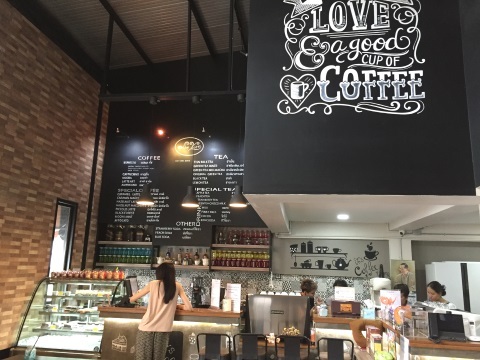 The baristas behind the counter take your orders for coffee, other drinks and food. However they are deaf. How do you place your orders then? Through a simple technological device which we used every day, the touch screen. Step 4 – The amount to be paid will be displayed, when you pay up, the amount paid will be keyed in by the staff and will be displayed together with the change due. It can’t be any easier. Take a seat at the table you chose and your orders will be delivered to you. Make sure you sit at the correct table though. 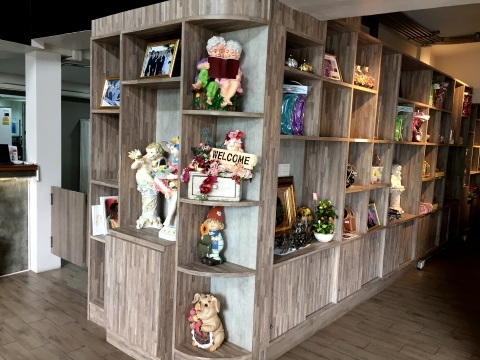 The Yimsoo Café is tastefully decorated and has a very pleasant ambience. 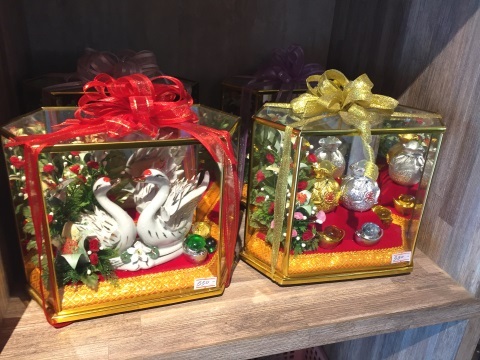 The sale of handicraft by the disabled is one way of helping them earn a modest income so that they can be financially independent. 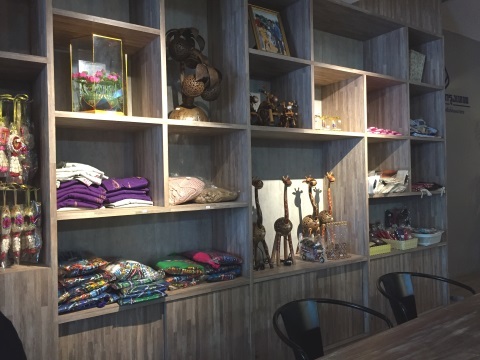 The handicraft is on display on the shelves on one side of the café. Do give your support. 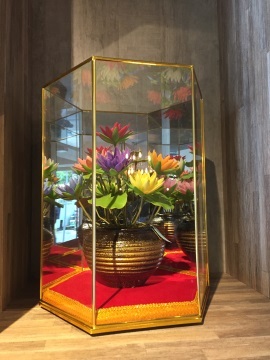 There is also a donation box in the café near the service counter. 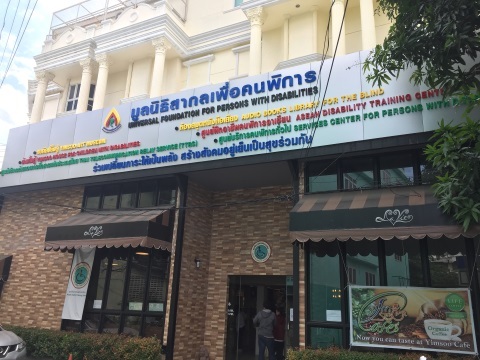 Today, the Universal Foundation for Persons with Disabilities has a branch in Chiang Mai that caters for Northern Thailand and branches in various other provinces. The movement that was started by Acharn Wiriya 18 years ago has gathered momentum. Acharn Wirya may not be a doctor, but he is still helping to heal shattered lives, empowering the disabled, raising their hopes, strengthening their will to succeed, preparing them for life towards a better future. All these men and women have one thing in common, they never give up. Yimsoo! We are grateful to Professor Wiriya Namsiripongpan for his permission to tour the foundation and gain an insight into the work done. It was an enriching and inspirational experience. Thank you Acharn Wiriya for the autographed copy of his book, "Fight on in Life – create opportunity in adversity". 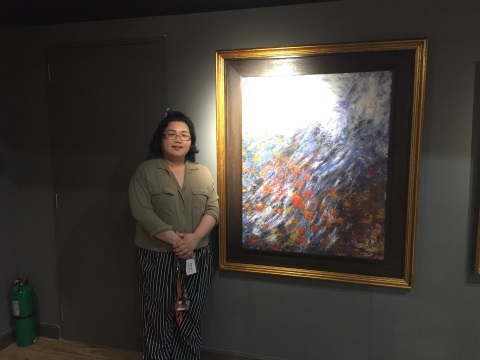 Thank you Puk Luk for the very interesting tour of the facilities and for her insights into the inspirations for some of the paintings. Go along Arun Amarin Road past Siriraj Hospital, cross the bridge over the Bangkok Noi Canal. Continue along Arun Amarin Road and turn left into Soi 39. You will see the foundation building immediately after turning into Soi 39. Free parking is available at a carpark about 100 m away as indicated on the map. Please make use of this carpark as the soi is very narrow and parking along the road would impede the smooth flow of traffic.